Abra-ca-dabra…Hocus-Pocus! Math-e-magician is here to spellbind you with splendid kids math games. Well, that was hilarious, personally speaking, I feel that Mathematics is like a person’s “ex”; more you try to run away from it the more it comes back to you! To the lucky ones, who somehow have discovered the elusive key to this mystery, it has become an arm candy. But ask those poor chaps who are still fighting out the lone battle with this brain teasing subject. Jokes apart, dodging the challenges thrown by Mathematics may seem an alternative to counter it, but this is not the solution in long run. The best way is to befriend it and embrace all those challenges with an attitude to learn and willingness to master it. Do this and the superfluous monster will vanish! As the brand Nike says…Just Do it! 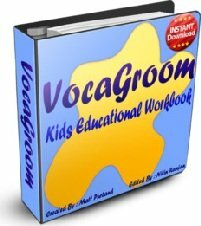 Help the kids to learn the basics of mathematics correctly and steadily lay a strong foundation of the subject. The following listed kids math games will make them do simple arithmetic (Addition, subtraction, multiplication & division) calculations in a fun way. It is a well known fact today that a lesson is well learnt if taught interactively and playfully. So why not mathematics? Implement this and I am sure you will be amazed to see the results. Good Luck! Game Objective: In this kids math game one has to create a 3x3 square matrix in which numbers are arranged to create a little magic! Game Learning: Thinking skills, simple addition. A magic matrix is a kids math game in which the sum of any row or any column is always equal. Not only this, even the diagonal numbers adds up to the same value. In the above example, there are two magic matrices shown, one is 3x3 (3 rows & 3 columns) and other is 5x5. In the former the magic sum is 15 while in the later one the magic sum is 65. Can you work out your own Magic Matrix? Give it a try! Note that Magic Matrix can only be created when the “order” of the matrix is odd. That means it has to either a 3x3 or 5x5 or 7x7 matrix and not 4x4 or 6x6. Though mathematically it is possible to formulate an even “Order” magic matrix, like 4x4, but the method is too cumbersome for young kids, hence avoided here. Here is the simple and easy method to create a Magic Matrix. Kindly refer the detailed illustration for a better understating. The method of formulating a magic matrix is called Pyramid technique. As the name suggests, in the first step one has to introduce some new “cells” to the given matrix in a pyramid form on all the four sides. The number of new cells added has to be (n-2), where n is the order of the matrix. For e.g. if we are formulating a 5x5 magic matrix, then the order of the matrix is 5. Hence, the number of new cells to be added is (5-2=3). After arranging all the new cells on all the 4 sides of the given matrix, in step two, we number the cells sequentially as shown. Lastly, fill all the vacant “cells” with the numbers as shown and the Magic Matrix is ready! Game Objective: In this kids math game one has to add, subtract and cross out the numbers along a number line. Game Learning: Basic calculation & strategy making. Draw a number line from -20 to +20 as shown in the representation. 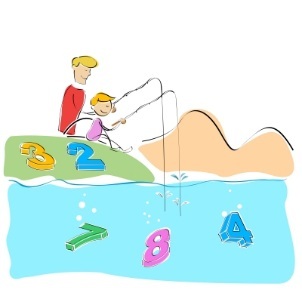 To start the kids math game, player A will select any 2 numbers and cross them out. Here in this example 8 and -2. He then has to add those numbers and cross out the number that is equal to their sum. For e.g. 8 + (-2) = 6. Now, player B has to start with this resultant number (in this case 6) and simultaneously choose a new number, say 10 in this case. Then, he has to add these two numbers and cross out the number that is equal to their sum. For e.g. 6 + 10 = 16. Again, player A will carry out the same operation and the game continues with both the players taking turns to cross out the numbers on after the other. The game ends when either of the players is stuck at the dead end i.e. no further crossing out of a number is possible. The player who gets stuck in such a situation Looses while the other who has brought that player in that situation Wins this fun kids math game. Kids can try to outplay each other by planning their moves in advance. The idea is to get the opponent trapped in such a position where he cannot strike out any number at all. To make this kids math game more challenging and interesting try extending the number line to 30 or even 50! Game Objective: This kids math game makes them do quick calculations in order to win. Game Learning: Addition, Subtraction, Multiplication, Division and estimation. Before we delve into the game download the schematic layout here. The game has been categorized into 4 modes, that are, addition, subtraction, multiplication and division. All the 4 modes of the game are governed by the same set of rules mentioned below. Players take alternate turns to throw the dice and simultaneously fill up the blanks of the grid with the number that comes up one by one. Once the grid is complete, players do the required calculation to derive the answer. The players whose answer is closest to 1111 wins the round (except for division mode, Grid 6, in which it should be 111). Play for 10 rounds and the one who has won more rounds Wins this cool kids math game! Both the players can first collect all their numbers by throwing the dice alternately and then arranging those collected set of numbers into the Grid in any order or sequence they want keeping in mind that it would fetch them the desired result (i.e. closest to 1111). Kids then take out the “difference” between their answer and the target number i.e. 1111 and note it down. The rounds will continue and the players note down the “difference” after every round. The first kid whose total of all the “difference” crosses 4444 loses the game and the other one wins! To make the game more challenging vary the target number or the number of rounds. Game Objective: In this kids math game the players have to move along a virtual math ball to reach a specified total. A penny or a small button. Decide a target number to reach (for e.g. 100) before the start of the game. First player selects a number on the game board and places a penny over it (say number 5). Second player slides the same coin to any of the neighboring number (say number 4), along the line, and declares the addition the two numbers (i.e. 5 + 4 = 9). First player will again take his turn and slides the coin to another number along the lines and declares the new total. This will continue till one of the players makes the total to be exactly equal to the pre-decided target number (i.e. 100 in this example) and becomes the winner. The total in any case, should not go beyond the target number. If a player does that then he loses the game. The players can move the penny strictly along the lines only. Jumping the lines is forbidden. The real fun begins when kids are approaching the target number and try to out think their opponent by not allowing him/ her to score the target total. Game Objective: A kids math game in which kids have to apply basic principles of coordinate geometry, addition, subtraction and multiplication. Game Learning: Coordinate geometry, addition, subtraction and multiplication. Take print outs of the game layout, one for each player. Both the players will fill out the vacant triangles with numbers 1-25 randomly (in any order). Both the players have to keep their game board hidden from each other throughout the course of the game. First player calls out a geometric coordinate, say for example C3 (column C and row 3), upon this both the players will locate the number occupying this coordinate and declare the same to each other. Kid whose number is greater than the other gets 1 point. Kid whose number is smaller than the other gets 0 point. Both the players will calculate the difference between their numbers and note it down on their respective sheets. The player gets 1 point for a correct answer and 0 point for the wrong answer. Once all the above operations pertaining to that particular coordinate number are over then both the players have to cross out that number. Now, its second player’s turn to call out a new coordinate. The game continues till all the numbers gets crossed one by one. At the end both the players will tally their points scored and the one will more points Wins this fun kids math game. Game Variations: Try addition or multiplication of the numbers instead of subtraction. All the other rules would remain unchanged. To make this kids math game more challenging kids can choose to play with higher set of numbers, like 20-45 or 75-100 etc. Game Objective: A kids math game in which players have to reach a target number using a set of playing cards. 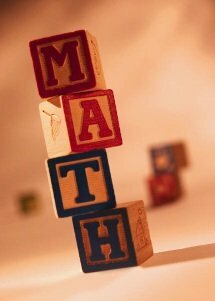 Game Learning: Mental calculation and basic mathematics. Take a deck of playing cards and remove the queens, kings and jokers from it. Play with the remaining set of cards. All the Jacks are “Trump Cards”. An Ace represents number 1. Rest of the number cards i.e. 1-10 represents their respective values. One of the players will deal 6 cards to every player. Keep the remaining deck upside down at the centre. One of the players will flip open the top two cards and reveal the “Jackpot Number” (the target number that players have to match). These top two cards must not be a Jack or number 10. If it happens then the deck has to be reshuffled and again 2 new top cards has to be pulled out. Suppose the top two cards turns out as a 8 and a 5, then the Jackpot Number is 85. Now, the players have to use their 6 cards in hand to match the Jackpot number. For this they can use any mathematical operation i.e. addition, subtraction, multiplication and division. For example, if the Jackpot number is 87 and a player’s 6 cards are: 5, 7,1,6,3 & 9. Then, he can match the Jackpot number as (5 x 7) + (9 x 6) + 1 – 3 = 87. A kids can use a pen and a paper to do the calculations if he finds mental calculation tedious. One the solution is arrived he has to yell Jackpot and show his solution to the other players. If players are struck with the set of cards that is not helping them to match the Jackpot number then they can take turns to pick up a new card from the top of the remaining deck and simultaneously have to discard one of the cards (so that a player does not exceeds more than a maximum quota of 6 cards at all times). Jack (Trump Card) can be used anytime anywhere to represent any number from 1 to 10. The game can be played for 5 rounds. A player will get a maximum of 6 points if he utilizes all the 6 cards in his hand to match the Jackpot number. Similarly the winning points decreases with the lesser number of cards utilized i.e. if a player matches the Jackpot number utilizing just the 4 cards then he will carry 4 winning points to the next round. Player who accumulates maximum points at the end WINS this fun kids math game for kids. This amazing kids math game can be varied according to the level of the participating kids by simply increasing or decreasing the number of cards dealt to every player! Game Objective: In this kids math game players have to strike out the target numbers by rolling the dice. Game Learning: Simple mathematical calculations. Before the game starts both players put together 8 target numbers that they have to match up. The target numbers can be under 100, say for example, 9, 21, 47, 55, 63, 76, 88 and 92. After this is done, both the players will take turn to roll the 3 dice and note down their respective 3 numbers that have come up. Pre set the time limit (usually between 1-3 minutes) within which both the players will try to match up any of the 8 target numbers using their respective 3 numbers (By addition, subtract, multiply or divide). If a player is able to match up the target number within the stipulated time limit then that player will shout Strike and that number will be crossed out. If none of the players are able to solve it within the time limit then the 3 dice will be rolled again and the kids will try to match up any of the target number with the new set of numbers. This will continue till all the target numbers gets strike out. Both the players will then tally their scores and the one with more Strikes Wins!!! Try to vary the difficulty level of this kids math game by altering the number of dices, number of target numbers or by choosing the target numbers between 100 and 500. Game Objective: A kids math game in which players have to reach zero in order to become a Hero! Take a sheet of paper and first player will write any 2 digit number on the top of it, say 99. Second player has to subtract any single digit number from it (between 1-9) and write the answer under it. This will continue till the someone hits zero. The kids will have to do their individual scoring on separate sheets. 2 points for getting an even answer. 3 points for getting an odd answer. 5 points for getting a square as an answer (for e.g. 69-5=64, which is a square of 8). 4 points for getting an answer that is a multiple of any pre-decided number, say for example 3 (for e.g. 57-3=54, which is a multiple of 3, as 3x18=54). Following this scoring pattern the kid who scored more points Wins this fun kids math game. To make this kids math game more challenging try to start with any 3 digit number, say 350 and start iterating from there. Kids may subtract any 2 digit number or a single digit number to reach Zero. Game Objective: A kids math game in which children use simple mathematical trick to amazed their friends! A pack of 50 candies. The child who knows the trick will play the role of a Math-e-magician and selects 2 players, player A and player B.
Math-e-magician will stand at a distance away from the 2 players with his back towards them. The Math-e-magician will ask player A to take any number of candies between 10 & 20 from the candy pack without revealing it to him. Player B now takes out double number of candies of what player A had taken out from the pack. Math-e-magician asks player A to give a specified number of candies to player B. This specific number has to be between 1 and 10. Now, Player A will whisper to player B how many candies are left with him and player B will give double of that number of candies to player A. At this the math-e-magician will turn around and magically reveal the balance candies left with player B. Do you know how math-e-magician does that? Game Variations: Up to your own imagination and creativity. The trick is simple. The balance number of candies left with player B will always be 3 times of the number math-e-magician had asked player A to give to player B earlier. Game Objective: A kids math game that magically tells a particular date. Ask your friend to write down his parents’ anniversary in digits in month-date format (for e.g. 1021, for 21st Oct) without showing you. Add 5 to the answer (2042 + 5 = 2047). Multiply this with 50 (2047 x 50 = 102350). Subtract 250 with the answer (102350 – 250 = 102100). Bingo! The first 4 digits of the answer is the anniversary date of your buddy’s parents. Try amazing your friend by magically unveiling his Birthday! Kindly also visit our collection of Online Kids Math Games where each and every game has been thoughtfully handpicked. These games will surely develop their thinking and math problem solving aptitude!